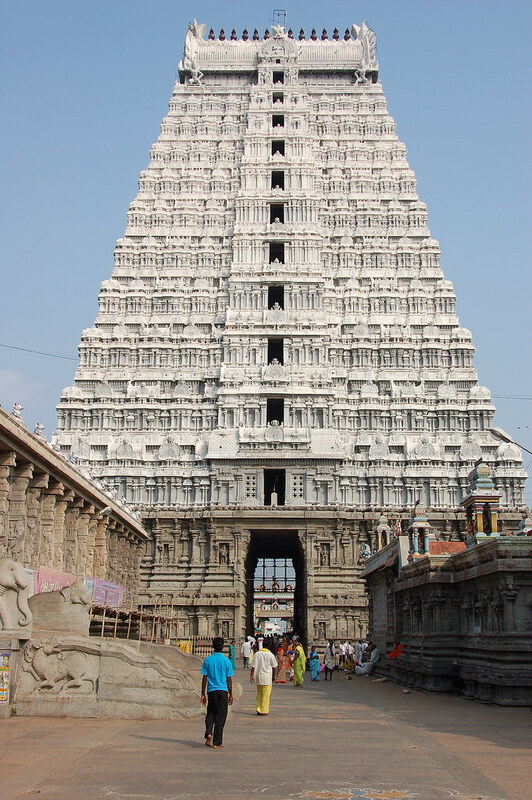 Trip to Tiruvannamalai – My Story – ISB and beyond !!! Went on a weekend trip to Tiruvannamalai which is located about 185 kms from Chennai. The route we took was Chennai – Tambaram – Melmaruvathur – Tindivanam – Senji (Gingee) – Tiruvannamalai. 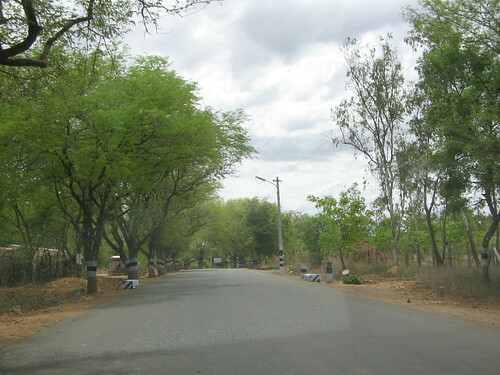 While traveling on the highway from Chennai to Tindivanam, one has to take a right turn about 4 km before reaching Tindivanam and proceed towards Senji. There are a lot of sign boards and it is difficult to get lost if one is following them properly. We reached Tiruvannamalai in about 3.5 hours (including the time for breakfast). It is considered to be one of the most important Shaivite shrines and is located in a huge campus with the Annamalai hill in the backdrop. The temple is beautifully constructed with 9 gopurams. There are 4 gopurams on the external walls, one in each direction. The main Rajagopuram faces the east. This is the ashram where Ramana Maharishi lived and is located a couple of kms to the south of the temple. The Maharishi left his home when he was 16 and had a unique experience then. The fear of death took over him and he started dramatizing what would happen if he died. Upon doing that he realized that he is actually the soul within the body and not the body itself. He left home, went to the Tiruvannamalai temple and started doing penance there. The ashram is a very calm place sought by people from around the world. I could spot many peacocks here which added to the place’s beauty. Free food is given everyday to people who visit the ashram. We stayed in the ashram’s guest house located across the road from the ashram. We were not charged for our stay and it was left to us to donate whatever we wanted to. The ashram has a library where one can read about Ramana Maharishi and his thoughts. 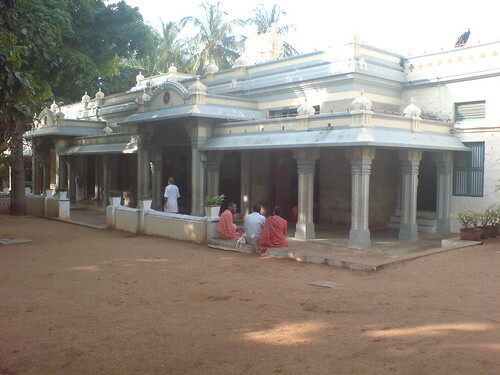 This is the ashram of another great ascetic – Sri Seshadri Swamigal. He was the one who identified Ramana Maharishi doing penance inside a cave in the Tiruvannamalai temple, brought him out and spoke about his greatness. This ashram is also a calm place very similar to Ramanashramam and is located near it (about 2 kms to the south of the Tiruvannamalai temple). One can book rooms and stay here. 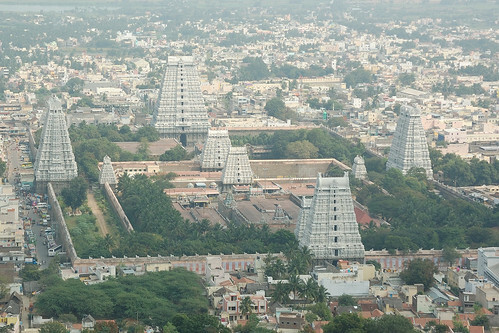 Girivalam refers to circumambulation of the Annamalai hill. One is supposed to do this barefoot. People normally start doing this from the Rajagopuram of the Tiruvannamalai temple, travel clockwise around the hill and complete it by coming back to the Rajagopuram. However some locals opined that one can start from any place around the hill and should complete girivalam by coming back to the starting point. The total distance is about 14 km and is supposed to be covered barefoot. The roads were nice for most part of the trip, except for the portions within the city where there was a lot of traffic and had a lot of pebbles. We started at about 5.30 AM in the morning and covered this in about 3 hours. There is a huge crowd during pournami days and the roads will be full of people. Since we didn’t do girivalam on a pournami day, we found the roads a bit deserted and were advised not to begin it before 5AM in the morning. Did you visit Parvada malai, which is quite near to Tiruvanamalai? There, you need to walk atop the hill over big stones over the mountains…. And then actually climb the last strech by climbing on the rock using rods and ropes planted there for support. Actually a friend took me there saying its fun to climb…. i guess he did have fun watching me climb! On the positive side, it was good to see the ladies and kids climb that casually…. one interesting experience I must say! No. We didn’t. Thanks for the info. Will definitely try it out the next time. Very nice post. I was there last year, was walking around the Arunachala mountain all myself. Very great experience, Sadhus & Sanniyasis are every where. Thanks. I had a good experience too! In your opinion, is it safe for a woman to do the girivalam alone? It took you 3 hours… did you not go for darshan of the eight shiva lingams on the way? Or does this time include the visits to temples on the way. Are there places to rest on the way. I ask this because I am around 60 years old and will need to sit down . How much did you have to pay for the Ramana Ashram. How much for Seshadri Ashram. Q) In your opinion, is it safe for a woman to do the girivalam alone? [Ram] We asked the same question to locals and the answer we got was that it is safe during the day time. I presume day time would mean 9AM to 5 PM which would be the hotter part of the day. In short, I would request you to not go alone. There are a lot of monkeys and dogs on the way and it would be advisable to go at least in small groups. Q) It took you 3 hours… did you not go for darshan of the eight shiva lingams on the way? Or does this time include the visits to temples on the way. [Ram] We saw most of the temples on the way from outside only. We only went inside a few temples. Q) Are there places to rest on the way. I ask this because I am around 60 years old and will need to sit down . [Ram] Yes. I found shops with chairs and benches. Most temples on the way also have places to sit down. Q) How much did you have to pay for the Ramana Ashram. How much for Seshadri Ashram. [Ram] As far as I can remember, we payed a voluntary donation to the Ramana Ashram and weren’t charged for our room. I am not sure though and would request you to please check with the Ramana Ashram people over telephone or email. Contact details can be got from their web site. My name is Abirami kumar and I am your coordinator in thiruvannamalai. We have reddy to share our 30 years living Experience for you, and we hope you’ll like it! I am happy to be a part of this exciting saw you at thiruvannamalai and I look forward to learning and interacting with you here on this platform. We will be in touch over the Everyone! We would be happy to learn more about you, our Visitor. Please be so kind to introduce yourself by answering to my post.